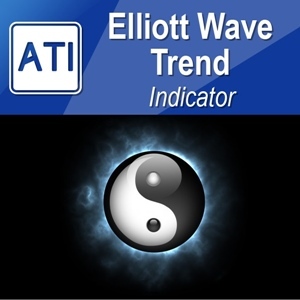 The Market Activity Index can be used best to visualize the alternating form of low and high volatile market. 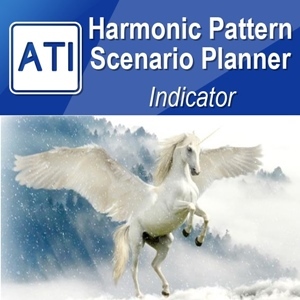 It is very useful tool to pick up the quiet market but ironically this is the powerful tool to predict the highly volatile market. Greatest thing about the Market Activity Index is that the reading of this indicator is bounded by its top (1.0) and bottom (0.0) limit but for the bottom limit will never diverge from actual price movements. It means that for the reading of 0.08 Market activity Index can’t be calculated from highly volatile price movement. To visualize how important this concept is, imagine that price can still go even further up even after the RSI reading indicates over 70 overbought signal (This can happen to 99% of oscillators.). The same thing can happen to ADX or most of technical indicators. For example, 25 reading of ADX can be still calculated even if there were quite extreme price movement before. One might say that these are false signal or lagging signal. 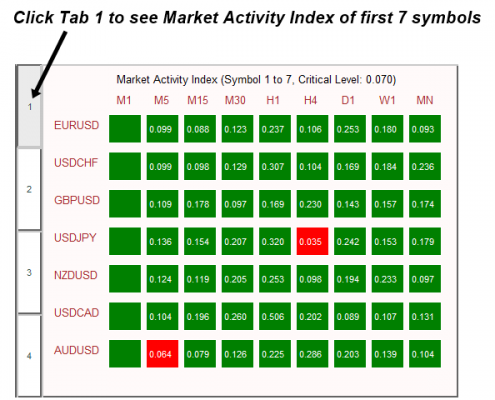 Market Activity Index is not a magic indicator but it will do its job reliably notifying the quiet or sideways market period to traders most of time. 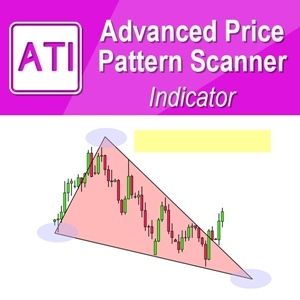 This tool can help you to understand and learn the market rhythm. 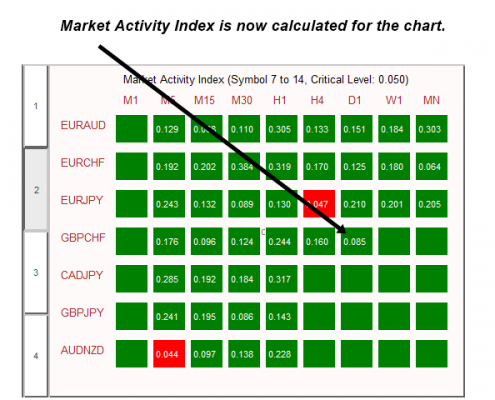 Market Activity Index Indicator is useful for the complete volatility analysis for single currency pairs. Instead, you might prefer to monitor volatility of multiple instruments at the same time. In such a case, Market Activity Index Panel is recommended. 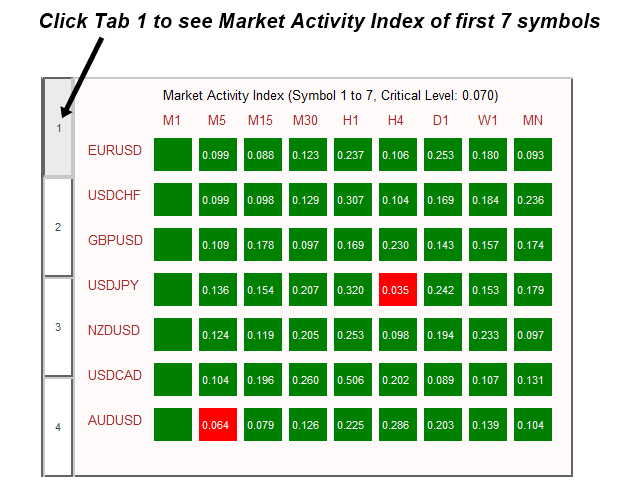 With Market Activity Index Panel, you can monitor up to 21 currency pairs efficiently. You can readily spot the currency pairs entering sideways market across different time frame and across different symbols. 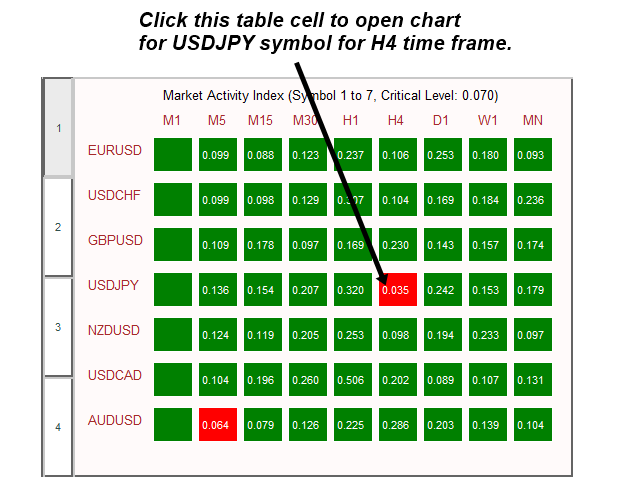 Once you spot the currency pairs and time frame moving in sideways market, you can open the chart by one click on your panel. 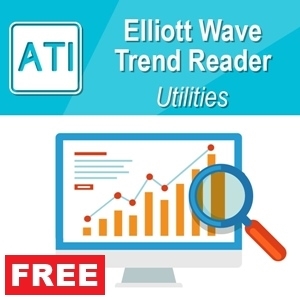 Reliable tool to monitor market volatility 24/7. 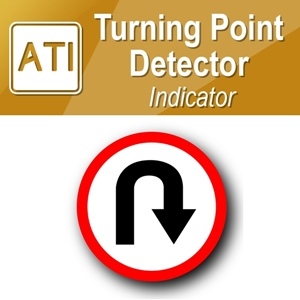 You can monitor multiple instruments efficiently up to 21 symbols. Very simple to use even without too much knowledge in trading and investment. 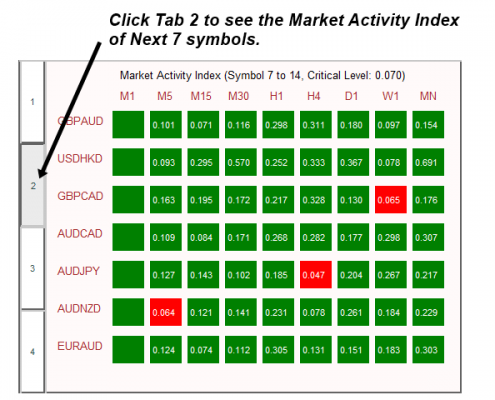 Market Activity Index can help you to understand market rhythms and you will learn how to dance with market for your trading and investment. Great supplementary tool to improve your trading. Comparing to traditional GARCH or ADX or ATR indicator, this tool is much more usable and more accurate for traders. Brand New Algorithm developed in house. 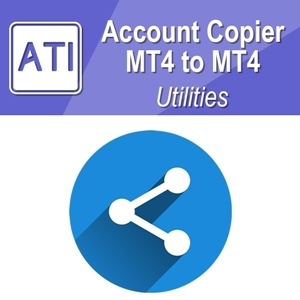 M1 data is normally quite dirty and not continuously updated from brokers. Therefore, in default setting, we have disabled the calculation for M1 data. Make sure to switch off unused timeframe to save computation. 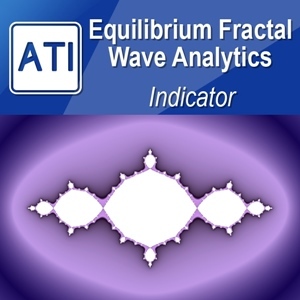 The Market Activity Index is designed to oscillate between 0.0 and 1.0 theoretically. Level 0.0 indicate theoretically dead quite period and Level 1.0 indicates theoretically maximum volatility. However both 0.0 and 1.0 will never reach in practice. Instead, use can choose 0.05 or 0.1 to detect sideways or low volatility period. Level 0.05 or 0.1 also corresponds to the common 95% or 90% critical value used in statistical hypothesis testing. Also the similar practical consideration as in the statistical hypothesis testing can be applied to the operation of Market Activity Index. According to our observations, some currency pairs works better with 0.05 critical value and for some other currency pairs, 0.1 critical value works better. Choice of critical value should be made accordingly to the price data itself. Sometimes, critical value 0.07 or 0.08 is fine too. 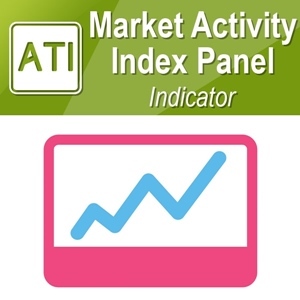 Market Activity Index Panel operates on fully automatic manner. 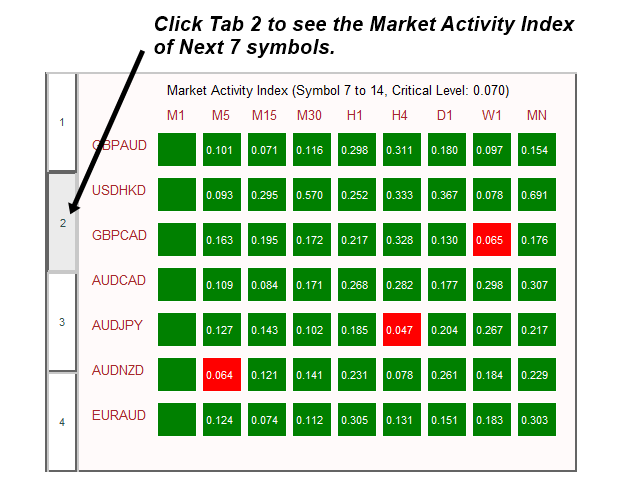 Market Activity Index Panel will scan up to 21 symbols in your Market Watch. However, You don’t have to keep 21 symbols in your Market Watch always. You can keep only 5 or 8 symbols if you wish. 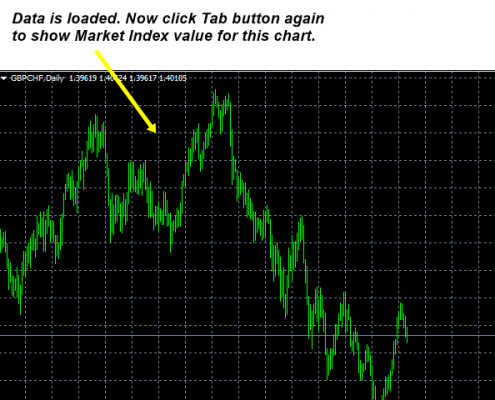 Arrange your Market watch in a way that your preferred symbols are listed. So remove symbols you hardly use for your trading. Once your market watch table is arranged, then open any chart from your market watch and attach Market Activity Index Panel to the chart. 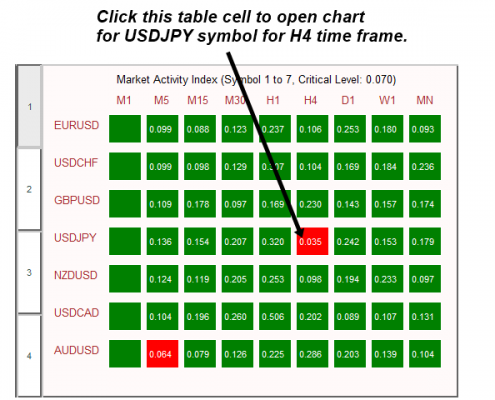 Market Activity Index Panel will load data and calculate Market Activity Index for each symbols and time frame. 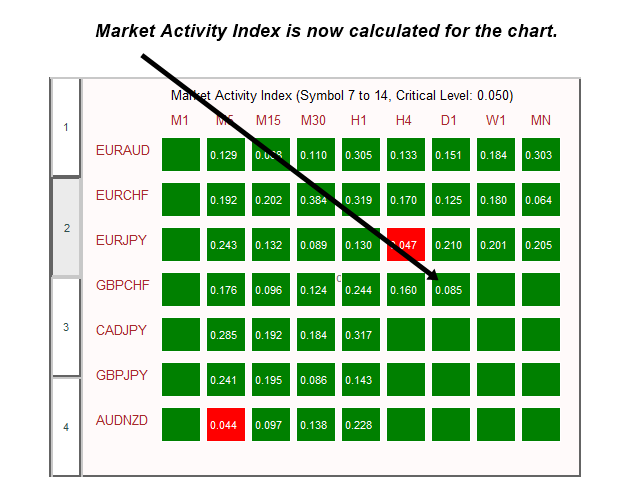 Initially Market Activity Index Panel can have some loading and calculating time. 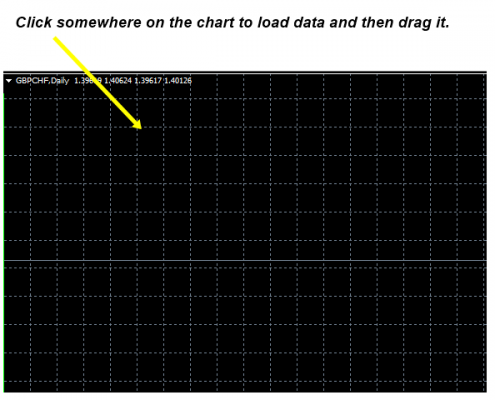 Sometimes, for the symbols not used often, the data may be not fully loaded from your broker. 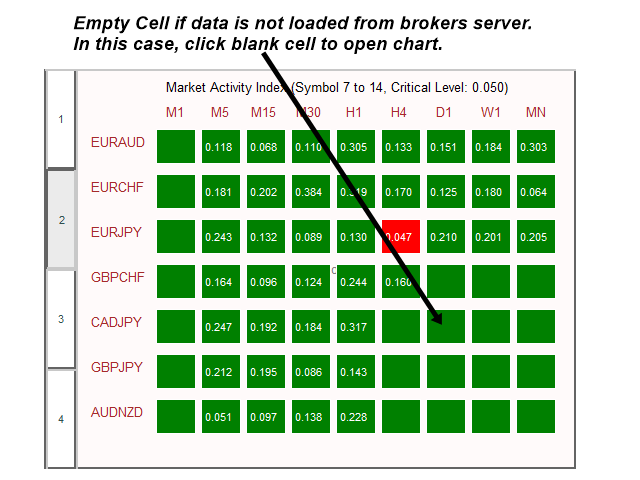 In that case, the index value will be left as blank cell in the Market Activity Index Panel. 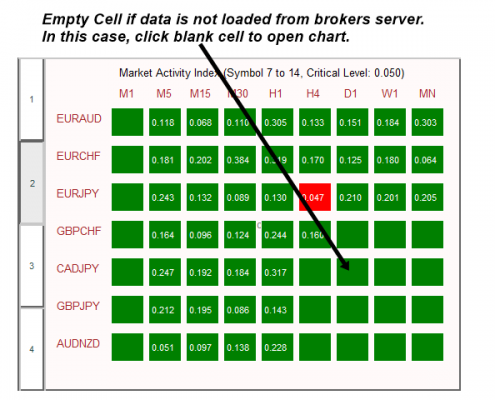 Remedy is simple, just click on the blank table cell to open the chart, then click somewhere on the chart to load data. 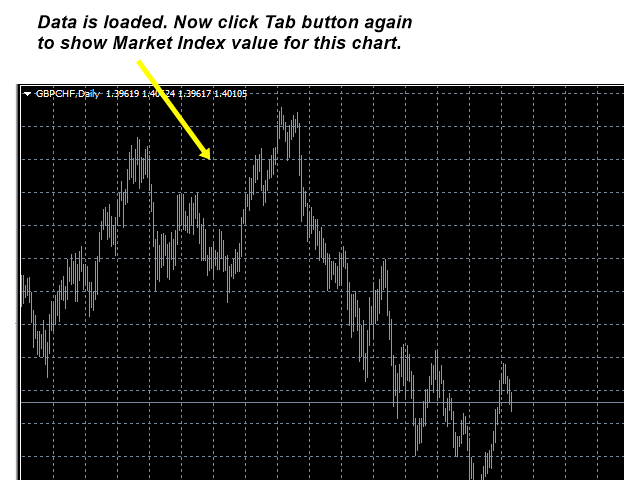 After that, click tab buttons to recalculate the Market Activity Index value for that chart. Otherwise, calculation will be updated automatically every calculation interval. Also note that Market Activity Index value in the panel is based on the latest completed bar and not based on last close price.